I got a craving for Spaghetti Carbonara but wanted to maintain my commitment to healthy meals. The compromise I came up with is this kind of pasta-salad hybrid. The Rock Star and I thoroughly enjoyed it and even though my crumb snatchers complained about me “ruining it” with the arugula, I think they liked it too! This “salad” can be eaten without the greens if you like. The creamy, cheesy, bacony goodness of the classic Italian dish can’t be resisted. 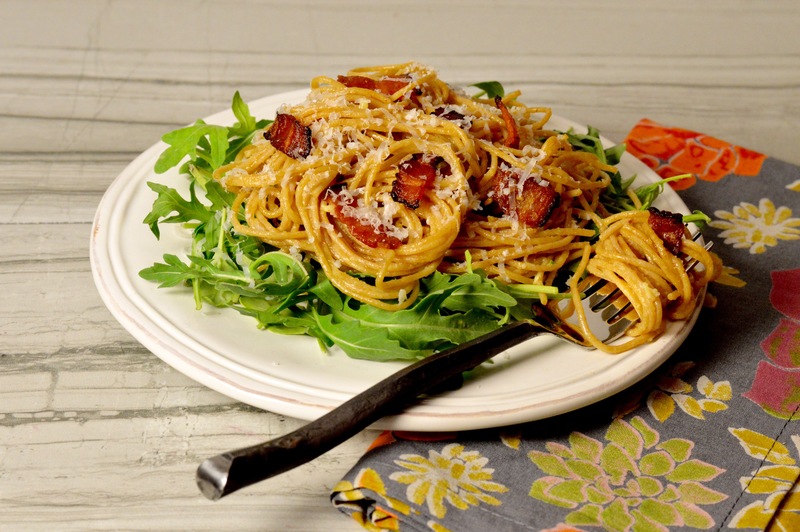 Sometimes referred to as “Bacon & Egg Spaghetti” for the use of, you guessed it, bacon and eggs, this will be a departure from your usual spaghetti dinner. Only 5 ingredients and about 20 minutes to prepare, your weeknight just got deliciously cheap and easy… like your mom! Oooh! Cook pasta in salted water according to directions. Do not over cook. In a small bowl beat together eggs and grated cheese. Set aside. Add minced garlic to the pan that you fried the bacon in and sauté until fragrant. Lower heat to medium. Drain cooked spaghetti, reserving 1/2 cup of the pasta water. Add spaghetti, egg and cheese mixture and bacon to the pan with the garlic, still over a medium heat and toss together quickly. Take care not to allow it to sit still in the pan or you will have scrambled eggs. Once fully incorporated, add pasta water 1 tablespoon at a time until you’ve reached the desired creaminess. S&P to taste. Serve atop a bed of fresh arugula and enjoy! Next Post Salted Caramel: Science!